Opposite the kitchen cabinetry covered in wool fleeces stood a wooden animal trough filled with water. It is suggestive of the font of holy water at the entrance of a Catholic church. The animal trough pairs with the freshly shorn wool fleeces, and recalls the manger scene outlined in the Christian Christmas story. The trough stood on a red hand-woven rug. 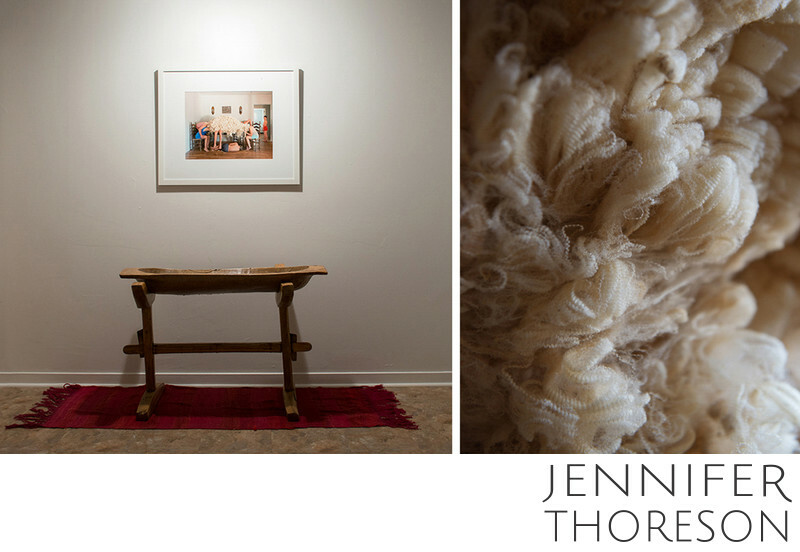 To weave it, I spun yarn from the red wool used in the large tumorous sculpture in the photograph Cancer. The act of re-purposing and re-vitalizing is a consistent theme through this body of work, and illustrates re-birth, renewal, and grace. The image on the right shows the beautiful crimps in the white wool that covered the surfaces of the kitchen.